More Halloween polish swatches? AW HELL YEAH! Today we're gonna be taking a look at the Pretty and Polished Halloween Collection, which is pretty legit if you ask me. There are some really unique things going on here. Let's get started. 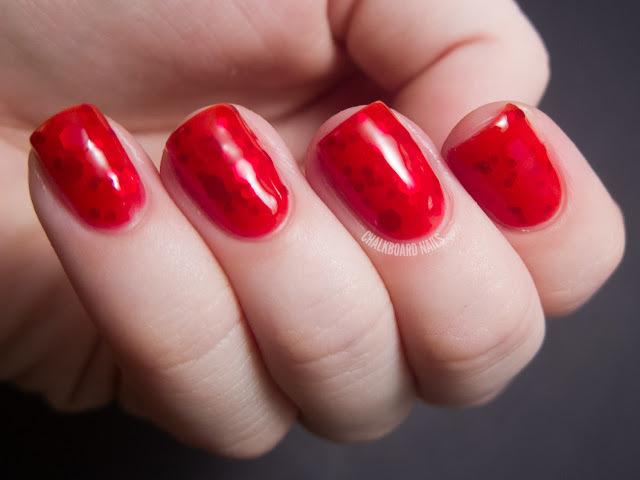 Blood Clot is a red jelly polish with large and medium red hexes. The hexes are only slightly darker than the jelly once you've layered a few coats of it, which creates this really unique effect that I don't think I've seen in an indie before. I found this to be shockingly easy to apply for being a jelly glitter. This shows three coats. Them Bones is likely my favorite in the collection. 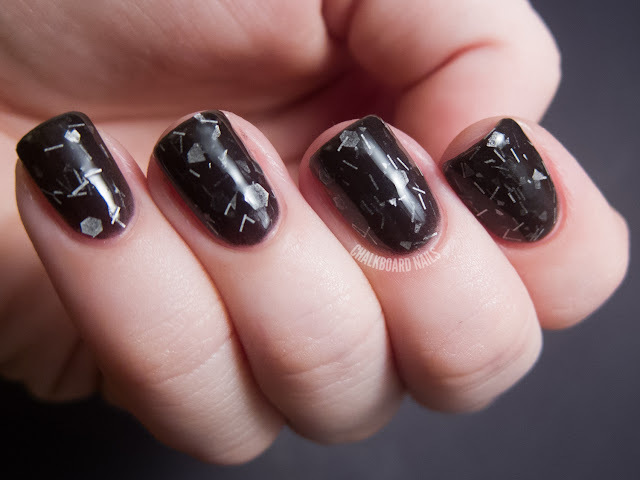 It's a grainy black jelly base with white hexes and bars, meant to look like a deconstructed skeleton or a pile of bones. I know that "grainy black jelly" sounds kind of weird but it's really unique and beautiful, in my opinion. It makes the polish look kind of aged, like an old movie or old photograph. Again, application was not difficult and I've used three coats here. Witchy Woman is a very complex polish. It is a grey-purple jelly base with purple shimmer, green, black, and fuchsia glitter, and purple shards. It can be layered to opacity in about three coats, but I've chosen to show it here layered over Zoya Petra because I loved the combo! 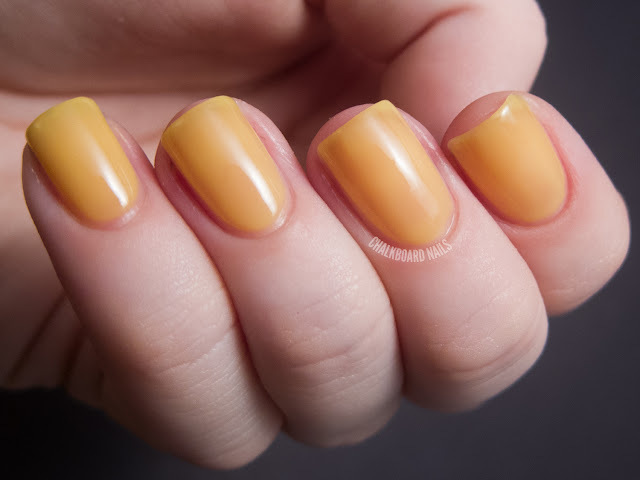 Finally, we have Candy Corn, another one of Chelsea's color changing polishes. 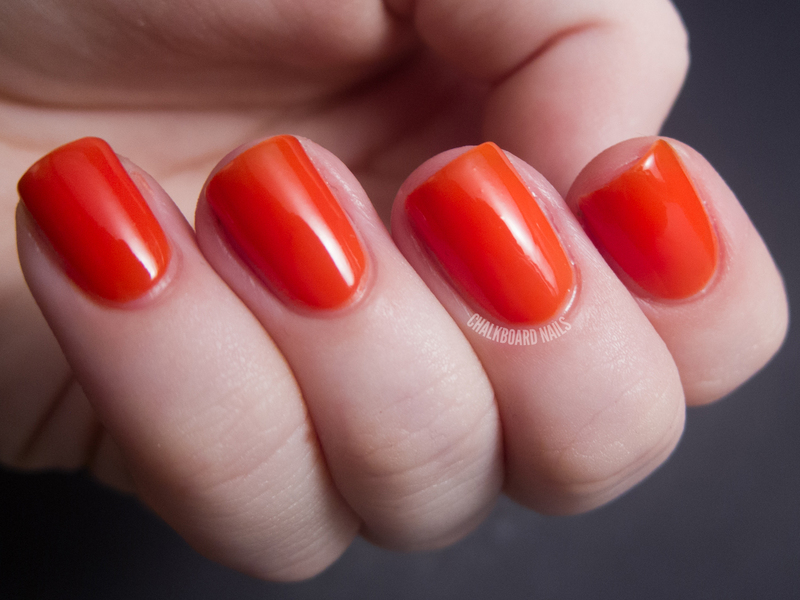 Like Day Trippin', this polish changes color based on temperature. It is quite sensitive and changes very easily, and works with topcoat on. You can see a video of Day Trippin' changing here; this one works in the same way and with the same sensitivity. I needed four coats for this. When it is warm, at normal body temperature, it is a yellow jelly. It wasn't the most flattering of yellows on my skin tone but I guess that just makes it more spooky for Halloween, huh? When cold, it is a highly pigmented and dark orange. I dunked my fingers into cold water for this photograph. You can literally watch this polish change colors if you so desire! In this photo, I dunked my fingers in cold water and then let my body temperature heat my nails back up. My nails are still orange where there are beads of cold water keeping them cold. Neat! The Pretty and Polished Halloween Collection is for sale now (at the time of posting) on Etsy so hurry up and snag these if you want them! You can also check out Pretty and Polished on Facebook for news and updates from the brand. Oh! even though I'm not a huge fan of chunky glitters, I LOVE Blood Clot! This is sooo pretty! I haven't jumped on the Indie bandwagon yet, but with these I may have to grab my trumpet and hop on!! I'm such a sucker for red polish.. Just ordered Blood Clot. I love the look of it, even with the big hex glitters that I'm usually not fond of. :) You make every polish look gorgeous though! I really like blood clot! it's stunning! Gorgeous polishes! Blood clot was so cool even though I liked them all! These are all great! 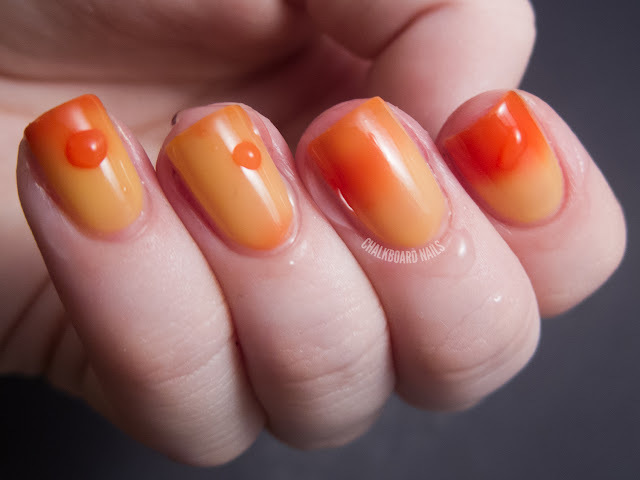 I love Blood Clot and the Candy Corn color change polish is fun, too! Love Love Love Blot Clot!!! Definately not something I ever thought I would say, lol!! the color changing polish is amazing! i have never seen anything like it! omg candy corn is so awesome!! Blood Clot is awesome! I'm considering getting that now, or maybe the color changing Candy Corn. Oh candy corn is fun! even if its not the most flattering of colors, if you have long enough nails for it to show the 2 colors.. awesome! That Blood Clot is fabulous! I like nearly all of these, I'll have to head over and have a look! Witchy women looks soooooo pretty! I love Halloween time! And these polishes are so goddamn gorgeous! Them Bones and Witchy Woman got my heart. I think I like Witchy Woman, even if it has big glitters inside. I definitely do not love big glitters, but they fit perfectly the polish!